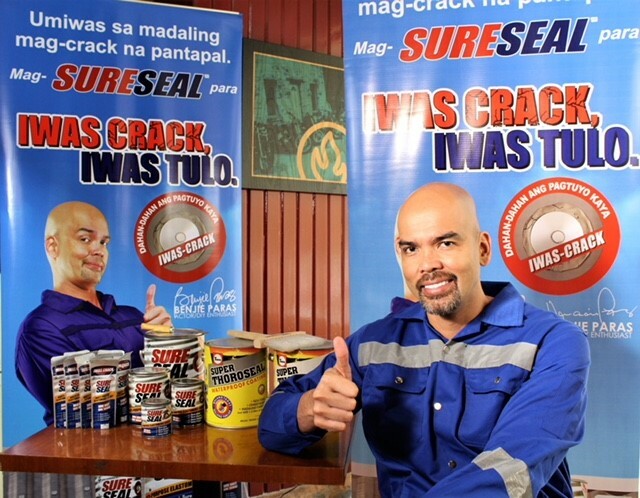 For the third straight year, actor BENJIE PARAS has signed up anew as brand endorser of elastomeric sealant Sureseal, which is being distributed in the Philippines by trusted industry leader Jardine Distribution, Inc. (JDI). During his contract signing last May 29 at Chilli’s Greenhills in San Juan, Paras reaffirmed his regard for Sureseal’s superior product quality and premium value for money. “I can personally attest to the credibility of the product that I not only represent but have likewise used. This has caused me to be more inspired to build on the gains of our growing partnership,” he said. Present during the contract signing were Peachy Tiu, JDI’s AVP for Construction Supplies Division, and other brand officials and representatives. Sureseal is an elastomeric, solvent-release, temperature-curing sealant that can be used as an excellent bonding agent in various substrates. Because it is made of polychloroprene rubber, it provides excellent adhesion strength for joined substances.Thanks to its ‘iwas-crack’ and ‘iwas-brittle’ technology, Sureseal lasts longer and works better than other brands—even on damp surfaces. Without the need to reapply frequently, Sureseal is more affordable and cost-effective, resulting in more savings on time and money. As Sureseal brand ambassador, Paras excitedly looks forward to exploring more opportunities and working on more projects with JDI, even as he hopes that homeowners like him would be smarter and wiser when purchasing construction supplies especially at the onset of the rainy season. Aside from Sureseal, JDI continues to advance its advocacy of “Caring for the Filipino” through its other quality product offerings: the Superbrand Solignum for tried and tested wood preservation solutions; Soilguard termiticide to protect your homes from termites; and Super Thoroseal waterproofing to prevent damages caused by leaks and moist accumulation. Jardine Distribution, Inc., represents a number of local and global companies that provide world-class crop protection and construction chemical products. They are focused on the safe use of these products, providing technical support, and with due consideration of environmental protection.